Because essential oils are highly concentrated and highly penetrating, some people are concerned about their safety. This lesson will help you recognize that they can be very potent, but can also be used freely as long as you follow certain very simple guidelines. Their concentrated state makes them not only powerful but also economical. You’ll soon recognize how many costly, synthetic over-the-counter products you won’t have to use any more when you start using nature’s safer and more powerful substitutes. Simply learn to respect their limits and you’ll be fine. Adjusting for the right quantity is a little like adjusting for spices and salt in a recipe. More is not always better. We have selected only the safest possible oils to be part of this program, so all you need to do is understand the following basic safety rules. It’s smart to review them from time to time so you feel totally comfortable with what to do when an oil feels a little “hot” or you accidentally touch a part of your body where there is a little extra sensitivity. It’s best to experiment now while the safety rules are on your mind. Then you’ll know what to do if you ever actually do have an accident and need to act quickly. Get out a bottle of a spicy oil like SpiceC or Cinnamon Bark. These will produce powerful results quickly on your skin. SpiceC has a small amount of cinnamon oil which, as you may know from certain cinnamon candies, can be a “hot” flavor. If you don’t have these two oils on hand, use whatever stronger oil you may have, like Peppermint, Clove, Wintergreen, Oregano, Deeper, Thyme, etc. Even the mildest oils should be used with caution. Have a little water handy where you can dip your fingers in and apply it. Have your mixing (Carrier) oil handy as well with the bottle open, ready to use. You may also want a cloth towel, paper towel, or tissue to wipe off extra oil. In this exercise you’re going to feel the “hotness” a little, then learn how it cools down as you apply a mixing oil or burns even hotter when you apply water. This is the first lesson of safety. Depending on the sensitivity of your skin, you will place a trace of each of these oils on a place where you can definitely feel the action. Oils like SpiceC, Cinnamon Bark and Oregano should feel a little hot, Wintergreen or Peppermint will feel sort of icy and hot at the same time. Those who may have allergic skin reactions should use the bottoms of their feet. Those with rather sensitive skin (but no allergies) can use the inside of their upper arm. Those with normal skin can use the inside of their wrist. Those who aren’t very sensitive at all can use their chin or even apply a trace on the corner of their mouth. If you only have mild oils on hand, use the corner of your mouth. A trace is less than a drop. For example, open the lid of the SpiceC. Smell this wonderful aroma. It’s a complex mixture of spices, citrus and other oils that you will come to enjoy as you use it on a regular basis. Apply a trace of this oil to your pinkie finger then apply it to the location you have selected. It should begin to feel a little hot within 10 seconds to about a minute. The area may even turn a little red. If it doesn’t feel hot at all, pick a more sensitive spot until you can, for sure, feel it a little. Step 4 Put a few drops of water on it and wait a few seconds. You should feel that it actually gets hotter. Water increases the speed of penetration of essential oils. So if you accidentally get a trace of oil into your eye, what would you want to avoid at all cost? That’s right. Water. Step 5 Apply a little mixing oil. Next comes the cooling part. Put a drop or two of mixing oil into the palm of your hand and apply it to the hot area. It will immediately cool down depending on how much of whatever oil you used and how long it had to penetrate. A mixing oil slows the action of the oil and allows it to penetrate without evaporating into the air and losing too much of its effectiveness. Step 6 Wipe off excess oil with mixing oil. Now you can try to wipe off the excess oil with a tissue, towel or cloth. This is a good trick to know in case you get a little too much oil. If you dilute the essential oil quickly, you can wipe it away and greatly reduce or stop the burn or cooling affect altogether. Step 7 Now go through the same steps with another oil. As you apply different oils, try diluting them and applying water to get to know their relative “hotness." You’ll quickly learn which ones are hotter and require greater caution. 1. You know that oils are “hot.” Even the most mild oils are to some degree “hot.” They may feel warm if they are put on sensitive areas of the body undiluted. 2. You learned to dilute oils with water if you want them to work quickly and with oil if you want them to work slowly. 3. You learned that essential oils dissolve in oil, not water. 4. You learned that trying to stop the “hot” with water makes the “hot” worse. 5. You learned in case of accidents to always carry a little mixing oil with your essential oils wherever you go. The vegetable mixing oil helps dilute and wipe up spills. If you’re caught without your mixing oil, simply grab a common vegetable cooking oil or anything oily such as butter, margarine or shortening. 6. You learned never to put undiluted oils in areas of greatest sensitivity. Dilute them first. 7. You learned what our hottest oils feel like so you won’t have to worry too much about all our other more mild oils. 8. You learned that people with allergies have to be extra cautious when using essential oils. Typically they can use them by ingestion and on the bottoms of their feet without reaction, but it’s always safest to test with a trace first and wait for awhile to see if there is any reaction before proceeding. 9. You learned that essential oils are highly concentrated. A little goes a long way. Here are the common-sense safety associated with essential oils. Read through them from time to time to remind yourself of the ways to respect the oils. 1. Do not allow essential oils in their fully concentrated (neat) state to come in contact with mucous membranes, ear canals, or sensitive skin areas. 2. Essential oils cannot dissolve in water. If you accidentally misuse them in an area such as on your mucous membranes, and they become “hot,” you can quickly dilute them with a vegetable oil. If you try to dilute them with water, it can make the situation worse. You can use margarine, butter, or shortening as well. 3. Any essential oils first-aid kit should always contain a bottle of quality vegetable mixing oil for dilution. 4. Never add undiluted (neat) essential oils to bath water without first mixing them with a dispersing agent such as bath salts or a body wash, shower gel, or mild shampoo. 5. Generally, people with allergies must use extra caution when using essential oils. They should test an oil to be applied topically first on a small patch of skin such as the back or arm. They can generally safely use oils in moderation on the bottoms of their feet or by ingestion. 6. Essential oils rich in menthol (such as Peppermint, Wintergreen, Birch and Spearmint) should not be used close to the throat or neck on children under 30 months of age. 7. Some citrus oils are light sensitizing. It is wise to not use them on areas of the body that will be exposed over an extended time to direct sunlight within 24 hours of application. This is especially true of children. 8. Always close essential oil bottles tightly after each use. They evaporate quickly. 9. Always store essential oil bottles in a safe, cool place out of reach of children and out of direct sunlight. Never store a bottle on its side if it has a dropper cap with a soft rubber top. Essential oils will dissolve the soft rubber in the dropper. For this reason use droppers only in bottles of oils you use up relatively quickly (within a few months). Even the fumes of some oils will, over an extended time, erode the droppers. 10. Do not apply undiluted (neat) essential oils on areas of the body that are inflamed (usually hot, red, dry, and tender). 11. Before you ingest even a trace of any essential oil or apply it to your skin according to instructions in this guide, first check the source of the oil. Most oils used in recreational aromatherapy are designed for aromatic use only and contain extenders or additives that make them potentially dangerous for undiluted topical use or ingestion. Take this quiz to make sure you understand the safety rules and how they are applied in everyday situations. 1. If you accidentally spill a lot of oil on the floor, what should you do? (a) Scoop as much of it up with your hand and apply it all over your body. (b) Use a little mixing oil to dilute it and wipe it up with a paper towel or tissue. Discard it. (c) Wipe it up with soap and water. 3. If you left the dropper cap on for many months and found it to be softer than usual and the oil beginning to look dark and cloudy, what would you do? (a) Replace the dropper with a cap and use the oil anyway. (b) Discard the oil and the dropper. 5. If after applying an oil with your fingers you accidentally rub your eye and get oil into your eye, and it starts burning, what would you do? (a) Wash it out with water. (b) Dilute it with a vegetable oil and blot it out with a tissue. (c) Endure the stinging because it will soon feel better. 6. Before you apply oils to someone’s skin, which of the following questions do you ask? (a) Do you have allergies of any kind? (b) Will you be exposing this area to direct sunlight within the next 24 hours? (c) How many months old is this child? 7. If someone gave you an essential oil as a gift and you learned that it was sold at retail in a bath-and-beauty shop, which of the following precautions would you take? (a) Never use it topically. (b) Never ingest the oil in any form. (c) Never use the oil in a cold-air diffuser. (d) Use it only topically in a very diluted form or for fragrance only in a heat or evaporation-type diffuser. 8. Which are the best places to store an essential oil? (a) on a sunny windowsill, (b) with the cap ajar so it can be used quickly, (c) with a rubber dropper and stored on its side, or (d) in a cool, dry place out of the reach of children. 9. Which are the best ways to disperse essential oils into bath water? (a) Drop the oil directly into the bathwater and mix it in with your hand. (b) Mix it first in a bath salt then add the salt to the water. (c) Mix it first with a body wash, shower gel or shampoo then add it to the water. 10. Because an essential oil will float on top of water, how do you get it dispersed in your drinking water or herbal tea? (a) Shake your water bottle or stir it into the water each time you take a drink. (b) Mix the oil into a little honey first, then add it to the water. 1. B or C. It can be dangerous to apply a lot of oil all over your body. Essential oils are very concentrated. Too much can overload your system and could possibly set up an allergic reaction to this and other oils in the future. Diluting it with oil is best, but soap and water can work as well. 2. D. Lavender is the only oil mentioned that doesn’t contain citrus oils as its primary ingredients. 3. B. Rubber is being dissolved into the oil. If you ingest or apply the oil you will also be ingesting and absorbing the black rubber. That’s not a good idea. 4. No. Deeper contains a menthol-containing ingredient. It’s not a good idea to apply it to the neck of a child under 30 months of age. 5. B. 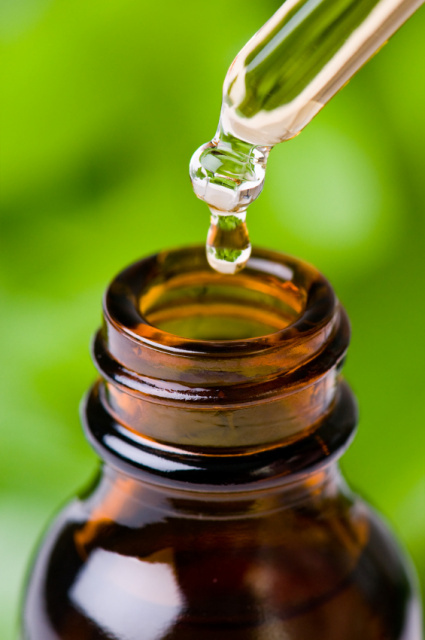 The essential oil needs to be diluted with a vegetable oil then blotted out with a tissue. It’s always safest to apply small amounts of essential oils with your pinkie finger so you don’t accidentally rub your eyes and get oils in them. Don’t ever let undiluted oils of a drop or more get in your eyes, ears, nose, mouth, or genital areas. 6. A, B, and C. All three questions are appropriate, depending on which oils you are using. The allergy question is important for all oils. The sun sensitivity question is important for citrus oils. The question about a child under 30 months is important for oils containing menthol such as Peppermint, Spearmint, Wintergreen, Birch, and blends like Deeper. 7. A, B, C, and D. You can’t be sure you are getting a high quality, therapeutic-grade oil. Use them only according to the rules for fragrance oils commonly sold in health food stores or bath and beauty shops. Low cost oils are often extracted in ways that destroy the therapeutic qualities or are diluted with chemical extenders that are not considered safe for any therapeutic use. 8. D. Keep your oils in an accessible place that is not in direct sunlight. Always cap them. Use the rubber stopper only on oils that will never tip and only for a few months at a time. Never leave them on the dashboard or seat of a hot car. 9. B and C. If essential oils float on the top of bathwater they will inevitably get into tender areas of the body where they can burn. They need to be dispersed in either salt or a bath and shower gel before they are added to the bathwater. 10. A and B. These are both great ways to enjoy essential oils and make sure you are not getting too much all at once. The essential oils used in this program are designed for safe, in-home use. The instructions here are in no way intended to serve as professional medical advice for a disease or condition that requires the intervention of a trained professional. No procedure is suggested as a substitute for consulting with your doctor or health care professional. Every effort has been made to insure that the information in this program is clear, complete, and accurate. This website is not attempting to give professional medical advice or services to the individual. You must assume responsibility for reading, understanding and applying the safe and cautious procedures described herein. You are urged to consult with a health care professional before accepting any procedure described in this program that could be considered therapeutic or undertaking any form of self-treatment. We do not claim that any procedure will unfailingly and uniformly perform exactly as described. Likewise we do not guarantee that every possible hazard, adverse effect, contraindication, precaution or consequence of overdose is included in the material presented here. All information is presented without guarantees. Youroilessentials.com disclaims all liability in connection with the use of essential oils as described here.